The 2005 Kashmir Earthquake (also known as the Great Pakistan earthquake) was a major earthquake centered in Pakistan-administered Kashmir and in Khyber Pakhtunkhwa near the city of Muzaffarabad. It occurred at 08:52:37 Pakistan Standard Time (03:52:37 UTC) on 8 October 2005. 86 000 people died, 32 000 buildings collapsed, and 2.4 million people were left homeless. 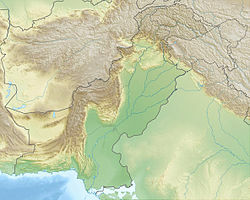 Kashmir, Pakistan, and Southern part of India were all affected. This page was last changed on 18 April 2019, at 13:32.